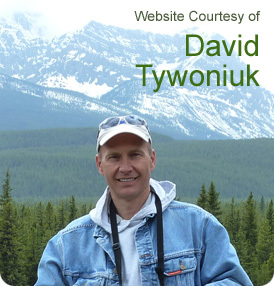 David Tywoniuk has been affected by scented products for most of his life. 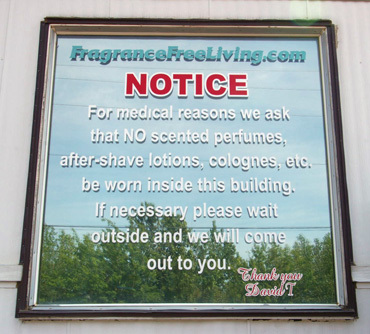 In fact, if you have ever been to his business, David T’s Auto Centre, one of the first things you will notice (besides all the cool Camaros & Firebirds) is a huge sign on the window indicating how seriously he takes this issue of Fragrance Free Living. Here is David’s personal story. Maybe you will relate to some of this. I consider myself to be a fairly level-headed, intelligent person. I have no allergies and am very healthy. About 15 years ago, at the age of 32 (that would make me 47 if you don’t feel like doing the math), I began to understand why I was experiencing drastic mood changes-from one extreme to the other. I was an Auto Body Mechanic. Although I never smoked, this industry is so loaded with toxic fumes that my sense of smell was deadened. When people would ask me how I could stand the smell, I would jokingly reply “What smell?” Everyone’s body can adapt and adjust to toxic scents. It was only after I quit this part of the business that I began to notice the reaction I was having to scented products. I purchased a car from a valued customer. Whenever I drove it, I would experience headaches and my lungs would hurt. Even with the t-tops off and windows down, I could not get any relief, obviously causing me a lot of anxiety. I tried repairing the exhaust, sealing and caulking the floor pan and engine compartment seals but nothing worked. Eventually I parked the car. Around the same time, my customers started to annoy me; I felt an instant dislike for at least one out of every three people who entered my business. I lost my patience. Thinking I was actually losing my mind, off to the doctor I went. The answer—an anti- anxiety drug of some sort. This helped a bit cause now I was high on drugs, covering up what was really ailing me. However, relief was only temporary. On my way to an out of town trade show with my girlfriend, I experienced another unexplained incident. I started to feel tense and anxious for some reason. I grabbed for a pill only to realize I had left them at home. This caused me more anxiety and anger. How was I going to manage this trip without my pills? I started punching the steering wheel in a rage as now I would have to turn around; I’d be late for the tradeshow, so in my unstable state, I just stayed home. Being a very strong willed person, I flushed the pills down the toilet, thinking they were the cause. They were not going to be my first addiction. About a month later, the gentleman I had purchased the car from came for a visit. Within moments of his entering the shop, I was overcome with the same reactions I had been experiencing both in his old car, with my girlfriend on the way to the trade show, and with many of my customers. I had no reason to dislike this man; he was a valued customer. The light bulb went on and all the pieces of the puzzle began to fall into place. The scent of his cologne was absolutely overwhelming and it had absorbed into the car’s upholstery and carpet. The scented products on my girlfriend and many of my clients were affecting me both physically and mentally. From that day on I started to pay close attention to how I felt around scents, everything from hyperactivity to depression, lack of energy, wheezing, uncontrolled shaking, difficulty concentrating, anxiety, anger, violent mood changes, and attention deficit disorder to erectile dysfunction. What a relief to know that I wasn’t in fact crazy although at this point you might be considering it. Please keep an open mind and keep reading. Backtracking from my childhood, it was a relief to finally have some answers instead of excuses for some of the incidents that had taken place—all triggered by scented products. Hopefully some of this has made you more aware of the negative affects that scented products have on some people. I experience none of the above reactions in a fragrance free environment. Products like perfume, cologne, shampoo and other hair products, hand and body lotion, makeup, deodorant, laundry products, household cleaners, things we all use on a daily basis are, in fact, affecting your health and well-being as well as others. 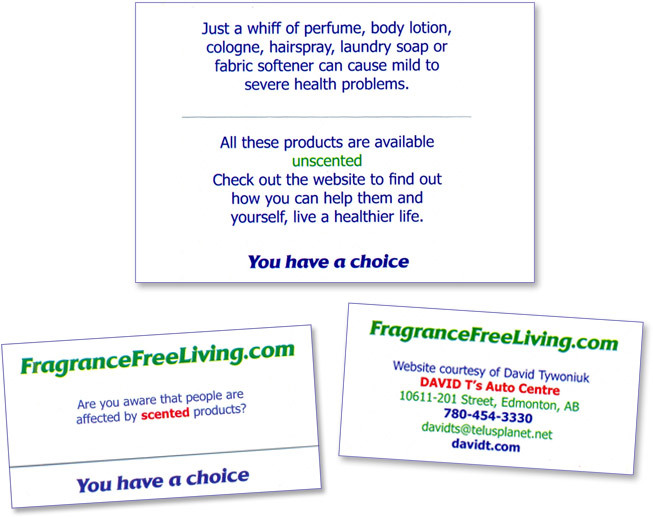 Here is a really good reason as to why you might want to try “Fragrance Free Living”. Did you know that the ingredient “Fragrance” used in most of the above products can indicate the presence of up to 4,000 separate, mostly man-made ingredients? Many compounds in fragrance are human toxins and suspected or proven to cause cancer. Symptoms reported include: headaches, dizziness, rashes, skin discolorations, violent coughing and vomiting and allergic skin irritation. Observations by medical doctors have shown that exposure to fragrance can affect the central nervous system, causing depression, hyperactivity, irritability, inability to cope, and other behavioural changes (Home Safe Home, Debra Lynn Dadd). 100% of perfumes contain toluene, which can cause liver, kidney and brain damage as well as damage to a developing fetus. Maybe you will think twice before you apply perfume and other scented products to your body; you could be causing yourself and others a great deal of harm in your desire to smell nice. Still not convinced? Check out some of the scenarios and other people’s testimonials. We look forward to reading your thoughts in the “Your Comments” section. Dave- Thanks for telling your story. Mine is remarkably similar. My problems started manifesting in my late forties, then rapidly got worse. I was lucky to catch onto what was happening and eventually took up an agressive “avoidance” lifestyle. Now, twenty years later, it has paid off. I’m doing pretty good as long as I keep away from all the stuff that messes me up. Thanks for sharing! I’m in my mid-twenties and I noticed my sensitivity to fragrances a few years ago. My home is fragrance-free and I have influenced other family members to do the same. And although they may not be sensitive to fragrances, they are still bad for their health and the health of others. Good for you. We couldn’t agree more. It is easy “to preach to the choir” but it is sometimes difficult to make people who “think” they are healthy realize, that in fact, their long term health is being affected. It would be great to have your testimonial to post on this site. Maybe it will help others influence their friends and family members. Take care and thanks for your comments. David, very well written, and I hope many will get your message. I have been trying to pass on this message for about 12 years. It hasn’t been easy– but I keep trying. There are people all over the world suffering from fragrance and the chemicals in our products. I think we are finally getting through to some. Now days there is so much info there isn’t enough time in the day to read it all, whereas years ago I had to search around to find info. Your being a man, I would like to say thank you for your story..because many men will not discuss their health to anyone. I have mcs illness and I appreciate your honesty about toxic fragrances…and sharing that with others..
in children , adults, and pets. We were taught that we did not feel dressed up if we did not have on perfume or cologne. A clean person does not need on fragrances. and pesticides in the home and office. That is what leads to developing the mcs illness. I can relate! At the age of 37 with NO health issues a person’s perfume at work became very bothersome causing dizziness, headaches and confusion within 3 months I had full blown MCS (Multiple Chemical Sensitivities) I now react to plastics, perfumes, air fresheners, gasoline, diesel, plastics, laundry detergents, pesticides, soaps, shampoo, new building construction, printers, paper, magazines, new cars, leather…the list is rather endless. I can’t stay in hotels, visit people’s homes, go to a mall, or have people over. It has changed my life dramatically and has placed very strict limits on activities and social events. Please understand that many of us react to scent free products as well, as they are often loaded with toxic chemicals. Thank you for the excellent articles, this is a real health tips to everyone. Chemicals is only good for engines/machines, it is dectructive for a human health. Dave, I’was injured by DDT & Mercury very early in my life & have been suffering from chemical sensitivity since birth. I am now 51years old. I know how difficult it is to maintain one’s resolve. I get so sick and tired of fighting chemical exposures almost daily. I have the same reactions as Michelle. I know how isolation can be so depressing. If they could only trade bodies for one day then maybe they’d stop using these “scented” products. We so appreciate your site post. You will discover dozens of ways we could put it to great use while having no effort with time and money. Thank you really with regard to helping make the post reply many queries we have experienced before now. Lol, yep decent point there. That brings to mind, I love the design of your blog page. Cannot wait to view more of your blog posts. Hey there I wanted to post an alternative remark here for that you tell you just how much i really Liked this read. I book marked you So I most definitely will be back following work in order to go through more of yer quality posts. Keep up that the quality work. whoah this weblog is excellent i really like studying your posts. Stay up the great work! You realize, lots of people are looking around for this information, you could help them greatly. fWijXs I think this is a real great blog article.Much thanks again. Want more. I recently had trouble finding a car without air fresheners/Febreez/fabric softener sheets used inside of it. Do you have recommendations for how to find a car that doesn’t have these chemicals in them? I’ve had MCS for about 15 years and am on disability. Not for MCS, of course. I don’t know anyone who has managed that! Do you know of any place in the world where fragrance is NOT popular? I’m thinking of moving to Mexico. Soon. Any advice? Thank you! I’ve lost two family members due to fragrance intolerance. As my father said, my brother was “too lazy to walk up 47 flights.” He got on an elevator with a woman with perfume on, and was dead by the time he got to his floor. ..own business”? The new room reeked of spilt cologne. And after a week the new neighbor started up with a smell exactly like the first.. I think someone was selling those evil candles around the dorms! I just wished there could be a way for them to guarantee me a room that would be safe rather than me moving repeatedly just hoping I’d randomly get a non-stinky room with non-stinky neighbors. There could be a wing for us, separate, the way there are nonsmoking wings! I had to quit that gig and have spent the past 3months trying to recover my health. I can’t go back unless I have a way of avoiding a repeat… that would surely destroy my health utterly. And now she got my sensitivity raised so high, I can’t tolerate scented bathrooms or busses or trucks, or coworkers who wear a whole bottle of cologne. So I turned to my union’s top Safety guy for help. I was afraid he would consider me a whiner or a wimp or even crazy. My joy was beyond words when, a couple minutes into that first call, he told me he knew what I meant and was behind me. How did he know? Because you help him with his car. You got me an ally and now he is trying to help me get the camps and worksites scent free! It will not be easy. But I am so happy that now, my Union is standing with me! And it’s all thanks to your being vical about your problem rather than hiding it like so many of us do. You gave me a chance to save my career. Thank you very much. In my younger days I suffered migraines particularly aggrevated by scents. I am averse to going to any indoor event because so many people bathe in cologne instead of water. I use nearly all unscented products – and find tolerance only to citrus scented items. Cooking scents, particularly garlic, also put me over the edge. There were times when my daughter was young that I had to throw away huge amounts of the girlie stuff she would bring home. Found out too late, that exposure to the chemicals used to develop 35mm film can cause multiple sensitivities. Working in the Cardiac Catheterization Lab, I was crosstrained to develop the 35mm film. That is when I started having migraines from smelling colognes, perfumes, scented lotions my coworkers were wearing. Every day was a headache. It has gone downhill from there for the last 20 years. Airplanes are a living hell. Malls? Avoided like the plague. Walking around the block outside, dryer sheet smell hangs in the air like a toxic cloud, immediately giving me a headache. Wood burning fireplace fumes do the same thing to me. Building up your immune system is your only hope to help, but that is limited in how much it actually prevents symptoms. My sister’s throat swells shut from allergies so I consider my migraines to be a minor problem compared to death. Good luck to all of you. Heard about a place called, “SnowFlake,” where severely allergic people have their own community. Hey, I’m ready to start my own. This lifestyle, or lack thereof, is pretty pitiful. Happy to find people who truly understand. David, my story is almost identical to yours. Auto body and paint, followed by chemical sensitivity to perfumes, solvents, etc. We need to talk. Please feel free to email me. At 49, I finally have the “proof” that my symptoms aren’t psychological. Growing up, I had the good fortune to live with my mom, who didn’t clean much and didn’t go for air fresheners, etc. After trips to the mall, I would have to lie down in the back seat of the car, nearly passing out, and with all strength gone, as if I were poisoned. As an adult, I would find myself looking to foods to blame for my reactions – swelling, joint pain, confusion, etc. And the pattern of being “fine” when at home for long periods, then getting very “sick” when getting a new job and having to quit.. this mysterious cycle was starting to convince even myself that I had a psychological response. With my new job, I work 1 week on, 1 week off – so I’ve been able to watch myself heal on my week off. I have been able to make the connection to the cleaning products and plug-in air fresheners (that never stop!) and the personal products I’m required to use on my clients at work. I just had a conversation with a director of my department about looking for alternative products they can use to make things easier for me. After the first week at this job, I had to start using crutches, my knees were so inflamed. My hope is that I won’t have to quit yet another job. The struggle is real! Thank you for your site! Thanks everyone for the wonderful posts, …and education. P.S. ..would be wonderful to find a career (at my age) that understands as you do, and I wouldn’t have to keep losing jobs every few months!